I've been home from Paris for 6 days now, and after the week of unpacking, doing laundry, and sorting through 6 weeks of mail, I'm sort of feeling ready to be productive again. So today I walked up the hill to good ole' Buena Vista park and did this sketch. I'm trying not to worry too much about my paints, which are in a box somewhere in the bowels of La Poste. I'm trying not to worry that the package tracking number on La Poste's web site gives me a message that says: "Colis en instance à La Poste, destinataire avisé disposant de 15 jours pour aller le retirer." That means, "The package is at the post office, receiver (that's me) has been advised to pick it up within 15 days". I have no idea what that means. My package is sitting in the Paris post office waiting for me to pick it up? What?? So it's looking like I might need to replace several hundred dollar's worth of good paints and brushes, but I'm holding out hope. a) Being a tourist and a poor speaker of French I'm afraid of French government employees, including post office workers (if you have spent time in France, you are afraid of them too). b) I don't know how to conjugate the verb "to insure" and I'm not sure they would understand me if I did. c) I heard a rumor from another American that if your box is worth more than 100 Euros you have to fill out special customs forms and the box has to go through lots of extra vague and scary processes. So I wrote the box was worth 85 Euros. d) I've tried to ship paint in the USA and they sure don't like it. Now I ship "vegetable oil based artist materials", but I don't know how to say that in French. So given all that, I took a risk and just shipped the damn box, and they probably x-rayed my package and found out it's not "livres et vestements" like I wrote on the form (books and clothes, misspelled) and on the x-ray machine they saw the squiggly metal tubes and the hinges of my tiny pochade box and thought it was something they would prefer not to ship. That's my guess. But they are French, who knows. Maybe they just thought my adorable pochade box was too lovely to leave their country. Anyway, in the meantime I am drawing in my little Louvre gift-shop sketchbook with good old pencil (did I mention my good charcoal collection is in the box, too?). 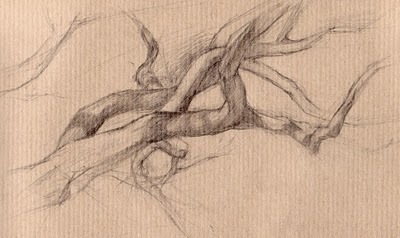 As I drew these branches I started seeing all this crazy fluid spiraling, kind of like muscles twisting around bones, with interlaced forms creating non-parallel tapering wedges .... turns out this organic, energetic human form I've been studying applies to trees, too.